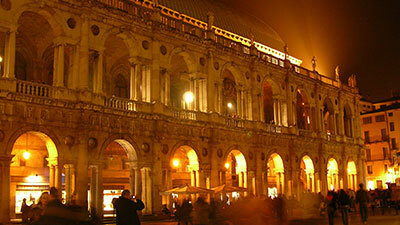 the beautiful art cities of Veneto. Veneto, for the richness of its historical and artistic patrimony and for the completeness of its offers, is the destination of choice for tourists sensible to environmental and urban quality, courtesy and hospitality. Count on the AbanoRitz to book tours and excursions, or for some recommendations on things to see. Venice is an incredible city, maybe the most beautiful in the world: 118 islands united by more than 400 bridges. The entire city is a work of art. Along the canals, which act like streets, lean out the aristocratic buildings (Palazzo Grassi is the home of prestigious exhibitions since 1986, becoming an international cultural site www.palazzograssi.it ), unique squares, many museums, narrow Venetian streets called “calli” and small squares called “campielli” at every turn, like small treasures..
You cannot come to the Veneto region without visiting Venice; you cannot visit Venice without navigating the lagoon. A kaleidoscope of landscapes that change throughout the day and across the seasons! You must visit the suggestive islands of Murano, Burano, Torcello, Pellestrina or Chioggia. Among the numerous events that take place in Venice, the most exciting are: the Carnival of Venice in the winter season and the Feast of the Redeemer in summer time. 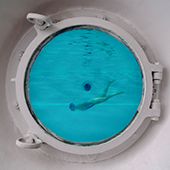 can be visited in many ways, choosing for example one of the many itineraries that conform to its different souls. 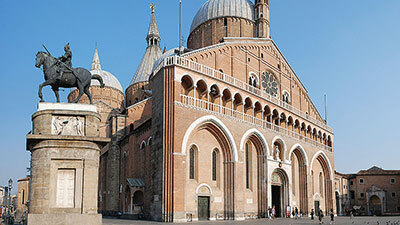 The Antonian itinerary will lead to the discovery of religious sites, regarding the figure of Saint Anthony of Padova. The itinerary can be extended towards the discovery of the city’s main religious sites, such as: the Cathedral, St. Giustina Church, St. Nicolò Church, St. Sofia Church. has preserved evidence of its secular history during the centuries. The Stone Bridge, the Arch of Gavi, Porta Borsari and Porta dei Leoni, but above all the Roman Theatre and the Arena are the most important and best preserved monuments of the Roman epoch. The religious patrimony is particularly rich, with the Churches of St. Lorenzo, St. Zeno and St. Stefano, the Cathedral of St. Maria Matricolare. Piazza delle Erbe has always been the centre of the city; nearby you can find the Town Hall building, the Lamberti Tower, the Palazzo degli Scaligeri, the Loggia del Consiglio, the Arche Scaligere. 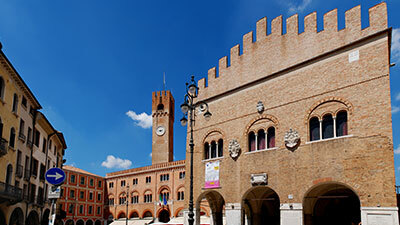 Verona is the “city of lovers”: the city of Romeo and Juliet and Shakespeare.. The city of Verona has always been in a strategic position; this is why there is so much evidence of military architecture, most of all “Castelvecchio” castle (14th century) and the nearby “Ponte Scaligero”. The lyric season takes place from June to September in the Arena of Verona. 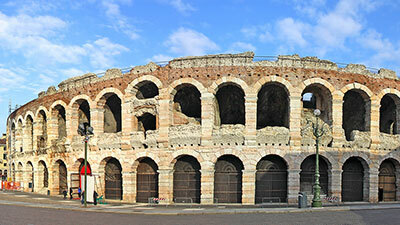 The Arena of Verona is one of the best preserved amphitheatres in the world (this elliptic structure was built in the 1st century AD) The first Season of the Lyric Opera Festival was inaugurated in 1913. www.arena.it Book your seat and transfer at the Abano Ritz Hotel. indissolubly binds its name with the great architect Andrea Palladio.
. Beginning your visit from the historical centre of Vicenza, it is possible to discover the main works of this famous architect: the numerous buildings designed for the nobles, such as Palazzo Chiericati, which is today the home of the Civic Museum, but also public buildings like the Basilica or the Olympic Theatre. In the outskirts of Vicenza you will find the most famous villa: Villa Capra, otherwise called “La Rotonda”. Chief town of what is called the "Marca Gioiosa", Treviso has maintained its chivalric culture characteristics, since when, in the municipal epoch, it became the most important centre of the Provenzal culture in Italy. The city, contained within the sixteenth-century walls, does not attract the visitor for a monument in particular, but for the city in its entirety, for its coloured buildings and elegant palaces, and for the water flow of the Sile River.. The province of Treviso is also pleasant in its entirety: if we mention only the artworks or its natural beauties, we would neglect the refinement of the cuisine and the wine production, appreciated in the whole world.. In the hill and pre-mountainous northern part of the Treviso province, you will find the very beautiful villages of Asolo and Valdobbiadene, the homeland of the famous “Prosecco”..
A ovest Castelfranco, una stupenda città murata, molto vicina alle sorgenti del Sile, il cui percorso è oggi Parco Regionale. E poi ancora il Terraglio, l'antico viale alberato che unisce Treviso a Venezia, ai cui lati sorgono meravigliose Ville VeneteIn the western part of the province there is Castelfranco, a wonderful city surrounded by ancient walls. It is located near the springs of the Sile River, that runs in an area that is now Regional Park. Terraglio is an ancient boulevard with a row of trees that unites Treviso to Venice. 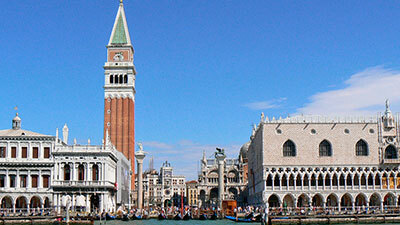 On the sides of this beautiful boulevard you will find the marvellous Venetian villas. Today, as in the 18th century, you can rediscover the pleasure of the ancient nobles of Venice, by taking the Burchiello ferry, a boat that regularly transported passengers back and forth on the Brenta River during the old golden vacation days. A pleasant and relaxing trip, on the panoramic ferry that sails along the river, from Padova to San Marco square in Venice, among the wonderful Venetian Villas on its banks. The Patrician Venetian villas of the Brenta river, "la Malcontenta" and "Villa Pisani" designed by A.Palladio. The villas of Padova, belonging to the Lords of the Venetian Republic: Villa Barbarigo, Villa Emo, Castello del Catajo, Villa Contarini. The villas of Vicenza, designed by great architects: Villa Malinverni, Villa Rocca Pisana, villa Valmarana.